Many North Carolinians saw the repeal of the Ordinance of Secession and repudiation of slavery as the final steps to be completed for their re-entry into the United States. Now, the voting population of North Carolina had to select a new governor and representatives to form a new state government to lead and to help heal the pain from the death and suffering of the last four years. County governments were being re-instituted, and new political alliances were now being formed from former Whigs, Democrats, and newly freed African-American men. The war continued. Returning veterans found themselves in communities ravaged by death and destruction. Families were ripped apart by the war, and communities found themselves divided politically between those individuals who supported the Confederacy and those who considered themselves as still loyal to the Old Glory. For these communities, the bloodshed continued until the pain of the past was erased from the memory of the community. Roughly 4000 miles to the northeast, one of the last symbols of the Confederacy was coming to a close. In the Mersey River, Confederate Commander James Iredell Waddell piloted the C.S.S. Shenandoah toward a rendezvous with Captain I. C. Paynter and the H.M.S. Donegal. At the time, H.M.S. Donegal was serving as a coastguard vessel at Liverpool protecting the river and the port facilities. Confederate Commander Waddell and his vessel had embarked on their cruise in October 1864 to strike a blow against Union shipping. By April 1865, the Confederate raider was in the Pacific Ocean attacking Union merchant ships, and a month later, Commander Waddell was striking against Yankee Whalers in the Bering Sea. In August 1865, Waddell learned that the war was over from a British ship sailing to San Francisco, California. From April 1865 to August 1865, Waddell and his crew had captured roughly forty-eight vessels during this time. Concerned that he and his crew would be considered as pirates, Commander Waddell immediately disarmed his ship and made course to sail to Liverpool, England. The C.S.S. Shenandoah sailed westward through the Pacific Ocean, around Cape Horn, and north to Liverpool. On November 5, 1865, the C.S.S. Shenandoah sailed into the Mersey River, and proceeded drop anchor near the H.M.S. Donegal. Confederate Commander Waddell formerly surrendered to his ship to Captain Paynter on November 6, 1865. A Royal Navy detachment watched as the Confederate colors were struck from the vessel. 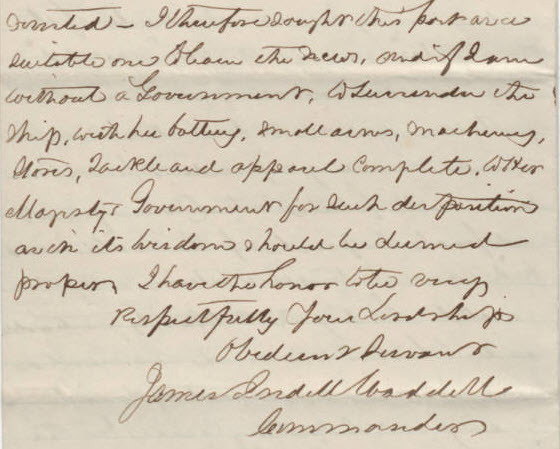 In a letter to the Earl of Russell dated November 5, 1865, Commander Waddell wrote “… to surrender the ship, with her battery, small arms, machinery stoves, Tackle and approval complete to her Majesty’s Government for such disposition as in its wisdom should be deemed proper…” James I. Waddell would not return back to the United States till 1875. C.S.S. Shenandoah was sold to a foreign buyer and was sunk in a hurricane near Zanzibar in April 1872. This entry was posted in First Wednesdays, News and tagged 1865, First Wednesdays, military-navy, North Carolina Digital Collections. Bookmark the permalink. I enjoy receiving these posts, but would enjoy them even more if someone would edit them for grammar and clarity. It’s rare that one shows the results of proper editing. The current issue contains five errors, by my count.